- The combined revenue of the associated companies was 13.5 MEUR in H1/2016 (unaudited), which comprised of 6.9 MEUR for Energy and Resource Efficiency related companies, and 6.6 MEUR for Decentralized Renewable Energy related companies. - The basis of Cleantech Invest's business operations are in the company's portfolio companies. It is through dividends (but more often exits) in these companies that the majority of income will be found. In the absence of financial income from portfolio company exits operational costs resulted in a loss of 563 thousand euros for the review period. - Cleantech Invest carried out a parallel listing and a share issue at First North Stockholm in April 2016. The offering of 1,075,270 new class A shares was oversubscribed 3.6x times. The number of shareholders in the Company approximately doubled due to parallel listing. The Board of Directors decided to exercise the additional share allotment of 215,050 new class A shares, increasing the share issue size to approximately 12 MSEK in total. Trading started on the 6th of April 2016, with the ticker code CLEANT A, and with the attached option rights with the ticker code CLEANT TO1A. *Please note: A reduction of value amounting 190 219.32 EUR was made on the valuation of Savo-Solar Oyj’s shares, which negatively affected the Profit and Loss. After the reporting date major part of this reduction in value has been reversed due to substantial increase of market value of Savo-Solar Oyj’s shares in July-August 2016. Our portfolios’ combined revenues for the first half of 2016 were up 214% compared to H1 2015, and are already higher than the full year in 2015. This comes after an already very impressive 2015, with 200% revenue growth compared to the previous year. Online cosignment store Swap.com and renewable energy provider Nocart both stepped into multi-million EUR revenue levels last year and will clearly be outperforming those levels this year again, with Nocart having already announced 12.9 MEUR worth of signed contracts and Swap.com crossing 1 MUSD in monthly sales. Solar thermal company Savo-Solar, listed on First North Finland and Sweden, also had strong sales in H1 with 3MEUR, doubling the sales of the corresponding period last year. Sofi Filtration, which does fine particle filtration for recirculating water, has had a market breakthrough during H1 with a total of 8 new installations sold, which is more than the company has sold in its whole 5-year history. Our latest investment, restaurant food waste minimiser ResQ Club, grew its registered user base to over 30,000 during H1 and the monthly gross value of food sold via the platform reaching 47,000 EUR in the month of June alone. The company has since launched in several cities and it needs to be noted that Resq Club was founded only year end 2015. Software-As-A-Service company Nuuka now has over 600 buildings connected to its building sustainability management system. Enersize signed a revenue sharing deal with Foton car factory in China, which produces more than 70,000 vehicles each year and has over 3,000 employees. Foton operates more than 10 similar factories in China. Enersize also received its first major payment of 300 000 EUR from an ongoing revenue sharing project. I could hardly be happier with how the combined portfolio is currently performing. However, none of this happens automatically, and it does not mean that there have not been considerable obstacles and barriers to this development along the way. In terms of continued accelerating revenue growth of our portfolio, the biggest risk is no longer whether the technologies work as they should or whether the market finds the offering attractive enough. The biggest risks relate to securing an adequate amount of growth capital and top quality human resources to back the growth opportunities ahead. Two factors that also go hand in hand. Securing funding to fuel growth of our companies has therefore been our key priority and has taken up a lot of our time in H1. - We raised another SPV and also did a small share issue of our own to be able to participate in the latest funding round in Swap.com. This funding round has now brought in approximately 8 MEUR into the company. H1 has been a crucial period for several of our companies. One during which the situation for several of them has been, as it is popularly called, make or break. The increased efforts to assist has required more travelling, working straight through summer, and using somewhat more external resources. Every penny has been well spent and this increased effort is what has resulted in us securing portfolio growth as well as us being able to maintain, and in some cases increase, our ownerships in several portfolio companies during the period. The value implications of this as a shareholder are significant. You may have noticed that our portfolio is a group of companies more or less ‘born global’. This is a pre-requisite when we choose our investment targets. In order to support and accelerate their development, but also to make sure that our own unique listed share gets the international attention it deserves, we decided to become a more globally visible company ourselves. I say our share is unique not as a buzzword but because no other listed share gives shareholders a diversified portfolio of the top Nordic cleantech growth companies. We started thinking about pop-up offices in selected places across the globe when we realized that more or less every time we go on a trip to one of the global hot spots for Cleantech we come back with valuable connections that lead to new investments in our portfolio companies, or new market introductions. So instead of travelling back and forth we have decided to truly dedicate ourselves to building awareness of Cleantech Invest and our portfolio on selected, suitable geographic markets, and build long lasting relations with investors in those places. So far, we have opened ‘pop-up’ offices in Stockholm and Los Angeles and are starting tomorrow (!) in Berlin. Those of you following us via social media, newsletters, events and other channels will notice that we have stepped up our communication efforts quite a bit. This is a conscious effort. We see a lot of value in having a big following, it makes it easier to reach people when they know who you are already, and it makes the threshold to invest in our portfolio companies lower if they are already well known and have shown investors how they proceed. And finally, for a company like ours with 15 different companies to describe, our own share also needs to be marketed and explained to new and existing investors. Our number of shareholders clearly shows that our following is increasing. We now have 2,639 shareholders compared to 844 in the corresponding time last year. We are proud of what we have achieved so far but will do even more on this front. Make sure you follow us as we set a new bar for shareholder communication We have plenty more in the pipeline! The combination of the two is extremely important. To be able to defend ownership or in some cases even increase as a target company performs well is in reality one of the biggest challenges in early stage investing. Our companies are now doing funding rounds that are sometimes size-wise completely out of our investment capacity. We have been told often that we would not be able to maintain our ownership stakes through our portfolio companies’ growth journeys, yet we have for the most part managed to do just that. The term Special Purpose Vehicle (SPV) demands a bit of explaining in this context. This is simply a holding company where professional investors that we know well (and who are interested in entering that specific company) invest together with us. It is an efficient way for us to secure additional ownership in our portfolio’s strong performers using legwork instead of money, and for the growth company it is a way to secure funding from an entity they already know and trust. We have raised two SPV’s in the last three months (one in Watty and one in Swap.com), which is an impressive feat in itself. Both companies are performing well, although in very different stages of development. In one of our super performers, Nocart (yes that is the correct term for it), we converted a previously given convertible loan. The conversion increased our ownership to 21.5% from 20%. This 1.5% may seem like a small increase but considering our value expectations for Nocart, it is anything but small and another example of how we increase ownership during strong growth. We are approaching suitable points at which to exit or stock-list several of our firms. To successfully do this requires a couple of things, the most important being the stage of business development of the company itself but not far down on the list is the company’s ability to communicate its case and continuously deliver results to the market. We are already working hard and will continue to do so in order to put several of our companies in positions to successfully list, and successfully grow in value once listed. We see no signs of growth slowing down during the second half of the year, on the contrary, we expect strong sales development for our combined portfolio this year. We expect that Swap.com and Nocart both become 10+MEUR revenue companies this year. We also expect strong revenue development to continue in Enersize, Sofi Filtration, ResQ Club and Nuuka Solutions. We take pride in having again been able to deliver strong portfolio value growth. I have said it before and I will repeat it: By the end of 2017 we will be the leading European Cleantech accelerator. One yardstick for this is obvious: companies that enter need to grow quickly while in our arms. The other yardstick, obvious if you are a shareholder (which by the way we all are, management and board), is our ability to generate superior returns for our shareholders. This is how we will ultimately be measured. We know this and embrace it. Our share has developed very well but it is merely a reflection of how our companies have grown, and it is important to note that our portfolio companies and our growth stories are still in their infancy. We aim to build a number of global success stories and expect strong growth to continue into the foreseeable future. Join us or stay with us as we maximise the positive environmental impact of our companies. The basis of Cleantech Invest's business operations are in the company's portfolio companies. It is through dividends but more often exits in these companies that the majority of income will be found. In the half-year review, Cleantech Invest briefly comments on all of these companies’ development during the review period and thereafter. Some of the associate companies' status is commented on a little deeper. These companies are selected on the basis that clear and tangible progress in the development of their businesses has occurred during the review period. These comments are not an exhaustive description of each of the associated company's situations or their risks. Associate companies are divided into two groups: 1) Energy and Resource Efficiency; and 2) Decentralized Renewable Energy. The combined revenue of the associated companies was 13.5 MEUR in H1/2016, which comprised: 6.9 MEUR for Energy and Resource Efficiency; and 6.6 MEUR for Decentralized Renewable Energy. The combined revenue of associated companies has grown by 214% when compared with H1/2015. All associate company revenue figures are non-audited. Swap.com continued to execute its growth plan and there were two major developments in H1/2016. Firstly, Swap.com launched its mobile application to cater for the ever-increasing mobile shopper audience. Secondly, Swap.com successfully launched a men's clothing category and is now selling clothes in all categories. Swap.com’s inventory currently exceeds 1M items. Due to this increasing inventory, Swap.com is doing investments into its fulfillment center in Bolingbrook, Illinois, to allow for further rapid growth;. Swap.com has during the period secured a funding round of approximately 8 MEUR into the company. Eagle Filters completed its recovery from a factory fire in May 2016. The company is working on its First Energy Service Contracts. Enersize increased its revenue well in H1/2016. 2016 will be the first year of significant revenues for Enersize in China. Currently Enersize has ongoing negotiations on several large customer projects in the Chinese market. In January 2016 Enersize signed its first contract with a major Chinese vehicle manufacturer. The total estimated income for Enersize for this project is 0.25 MEUR. After the review period in August 2016 Enersize’s first major Chinese customer entered into the revenue sharing phase. Enersize received the first 300,000 EUR payment based on accomplished energy savings. The total expected income for Enersize from BOE during the contract period alone is estimated to exceed 1.2 MEUR. Enersize has also after the review period entered into partnership with a second Chinese sales and implementation partner which has created a rapid and significant increase in the already large offer pipeline. Enersize has also raised a funding round after the end of the reporting period. Watty released its disaggregation platform for billing insights towards utilities. The company is currently piloting its solution with two large energy companies. In June 2016 Watty raised a 3MEUR funding round, led by Cleantech Invest and including EQT Ventures. SavoSolar revenue increased by 91.4% on the corresponding period last year, amounting to EUR 3,097 thousand (1-6/2015: EUR 1,618 thousand), a remarkable part of revenue derived from solar collector deliveries to district heating companies in Denmark. SavoSolar estimates that the company’s full-year revenue 2016 will be more than double the revenue in 2015, i.e. approximately EUR 4.5-5.5 million. The company's revenue for the review period 1 January to 30 June 2016 was 38,000 EUR (1-6/2014: 144,000 EUR). The change in revenue is due to smaller assignments in the associate companies. Personnel costs during the review period 1 January to 30 June 2016 amounted to 221,000 (345,000) EUR. Smaller costs are mainly due to not having the extraordinary one-time cost due to the previous managing director leaving the company. Depreciation, amortization and write-downs of intangible and tangible assets in the review period 1 January to 30 June 2016 was a total of 77,000 (66,000) EUR. The company's operating loss was 563,000 (EUR 428,000) EUR. The increase in the operating loss was due to smaller assignments in the associate companies and increases in other operating expenses during the period. Financial income in the review period 1 January to 30 June 2016 was a total of 24,000 (59,000) EUR, financial expenses a total of 190,000 (EUR 0) EUR. The increase in financial expenses is due to a reduction of value amounting 190 219,32 EUR that was made on the valuation of SavoSolar’s shares. SavoSolar shares are traded in First North Stockholm and Helsinki, and the market closing price at 30.6.2016 was used as the basis of valuation. After the reporting date this reduction in value has been reversed due to substantial increase of market value of Savo-Solar Oyj’s shares in July-August 2016. The net loss of the review period 1 January to 30 June 2016 was 729,000 (370,000) EUR. The increase in net loss is mainly due to a reduction of value amounting 190 219,32 EUR on the valuation of SavoSolar Oyj’s shares. The balance sheet total stood at 7,425,000 (6,063,000). The shareholders’ equity was 7,348,000 (5,954,000) EUR and the equity ratio was 99% (98,2%). Effective ownership takes into account both direct and indirect diluted ownership in the portfolio firms. Cleantech Invest has indirect ownership through the Clean Future Fund (CFF) and Cleantech Invest Swap SPV 1 AB, Cleantech Invest SPV 2, Cleantech Invest SPV3, Cleantech Invest SPV4, all of them Swedish holding companies founded by Cleantech Invest. Returns from portfolio company exits may in some cases differ from direct ownership percentages in portfolio firms, both in positive or negative direction. In certain instances, there are differences between ownership percentages and exit proceeds distribution order due to different share classes in the portfolio firm. Also, possible carried interest received by Cleantech Invest from CFF may increase the returns. Nocart Oy: In June 2016 Cleantech Invest increased its ownership by converting a loan in portfolio company Nocart. The ownership increased to approximately 21.5% from 20%. ResQ Club Oy: In May 2016 Cleantech Invest made an investment in ResQ Club Oy by subscribing new shares in the company representing 6.5 % of the shares after the investment. In addition, Cleantech Invest entered into a share exchange agreement with two of ResQ Club’s current shareholders, to further increase its shareholding in the company by approximately 2.2 %. After the investment and share exchange, Cleantech Invest owns 8.7% of ResQ Club. Watty Ab: In June 2016 Cleantech Invest SPV 3 AB, a Swedish holding company founded by Cleantech Invest Plc, made an equity investment of 1MEUR into Watty as part of a 3MEUR investment round. Cleantech Invest Plc owns 23% of the holding company and the effective fully-diluted ownership of Cleantech Invest Plc in Watty rose to 4%. Cleantech Invest Plc received a fee of 25,000 EUR related to the transaction. Alexander Lidgren acted as the Managing Director of the company during the review period. In addition to the managing director the company employed 3 persons, Tarja Teppo, Lassi Noponen, and Timo Linnainmaa, who together formed the management of the company. In the beginning of the review period the board of directors consisted of Lassi Noponen (chairman), Tarja Teppo, Thomas Bengtsson, Timo Linnainmaa and Jan Forsbom. On the 20thof April 2016 Peter Carlsson, Matti Vuoria and James Penney were appointed as new members to the board of directors. On the same date Timo Linnainmaa, Tarja Teppo and Jan Forsbom resigned from the board. Since 20thof April 2016 the board of directors of the company has consisted of Lassi Noponen (chairman), Thomas Bengtsson, Matti Vuoria, Peter Carlsson and James Penney. The most significant risks and uncertainties related to the business of Cleantech Invest Oyj have been reported in the listing prospectus dated 2.5.2014 that can be found on the company’s web site http://frantic.s3.amazonaws.com/cleantechinvest/2014/05/Cleantech-Invest-Oyj-listautumisesite.pdf and from the Stockholm parallel listing company description published in April 2016 that can be found on the company’s web site http://www.cleantechinvest.com/files/Memo-Cleantech-Invest_Oyj_febr_2016.pdf . There has not been any change in the risks and uncertainties since the date of the prospectus and the company description. Cleantech Invest is an international company with most of its portfolio’s revenue coming from Africa and the United States, followed by Europe and Asia. The company has very little exposure to demand from the Finnish market and we are also stock-listed in Stockholm outside of the Eurozone. Becoming increasingly international through pop-up offices in strategic geographic locations, Cleantech Invest will continue to raise international awareness of Cleantech Invest as a Nasdaq-listed investment opportunity, giving exposure to Nordic cleantech companies. The goal is also to boost our selected portfolio companies’ international growth too. 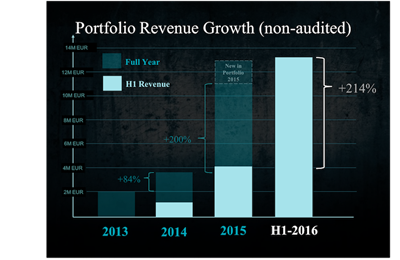 The portfolio company revenue growth is expected to continue to be strong during H2 2016. Nocart, Swap.com, Enersize, Resq Club, Sofi Filtration and Nuuka are expected to continue their strong growth paths, with others following. The Annual General Meeting of Cleantech Invest was held on the 20th of April 2016 in Helsinki. The Annual General Meeting resolved that five (5) members be elected to the Board of Directors. The Annual General Meeting re-elected the current members of the Board of Directors Mr. Lassi Noponen and Mr. Thomas Bengtsson as members to the Board of Directors and elected Mr. Matti Vuoria, Mr. James Penney and Mr. Peter Carlsson as new members to the Board of Directors. The Annual General Meeting resolved that the members of the Board of Directors be paid EUR 400 per month and granted additionally 10,000 stock options as annual remuneration. The stock options shall be issued based on the authorization granted by the Extraordinary General Meeting of 9 March 2016. The remuneration of the members of the Board of Directors is not paid to persons working for the company. Cleantech Invest board members and management team owned on June 30th 2016 in total 3,925,041 K-class shares, 483,144 A-class shares and options that give a right to subscribe 2,004,028 K-class shares, taking into account all stock and options that the persons own directly and indirectly through companies controlled or influenced by them or through their family members. The shares represent approximately 21,3% per cent of the company's total issued and outstanding shares registered on the 30.06.2016 in the trade register and 66,9% percent of the voting rights of the shares. Cleantech Invest had 2,639 registered shareholders according to the shares register on June 30th 2016. Of these, 935 were registered with Euroclear Sweden and 1,704 with Euroclear Finland. On 4 May 2016, the Managing Director Alexander Lidgren subscribed for a total of 150,000 new class K shares based on the stock options belonging to the stock option plan 2013. The new shares were registered with the Trade Register on 27 July 2016. On 10 March 2016, the Board of Directors of the Company has resolved to convert 211,119 class K shares owned by Prila Oy, 182,425 class K shares owned by Tarja Teppo and 182,425 class K shares owned by Timo Linnainmaa into class A shares with the conversion ratio of 1:1. On 4 May 2016, the Board of Directors of the Company has resolved to convert 155,000 class K shares owned by Alexander Lidgren (including the shares subscribed based on the stock options) into class A shares with the conversion ratio of 1:1. Registration of the said conversions with the Trade Register is pending. At the end of the review period Cleantech Invest A-series share was listed both in First North Helsinki and Stockholm. Cleantech Invest’s market value at the end of the review period was 17,496,951 EUR. When non-listed K-shares are taken into account and the A-share price in Helsinki First North Exchange at the end of the review period is used, the market value at the end of the period was 23,316,451 EUR. The closing price in First North Helsinki on June 30th 2016 was 1,13€ per share. During the review period the highest price in FN Helsinki was 1,51€, the lowest 0,94 €, and the average 1,20 € per share. The Series A share has a liquidity provision agreement with S-Pankki that fulfills the NASDAQ OMX Helsinki Oy Liquidity Providing (LP) requirements. In July 2016, based on authorization granted by the Extraordinary General Meeting on 9 March 2016 and subscription commitments received from a small group of investors, the Board of Directors of Cleantech Invest Plc (“Cleantech Invest” or the “Company”) has on 25 July 2016 resolved on a directed share issue (the “Offering”). In the Offering, 793,271 new class A shares (the “Offer Shares”) were offered for subscription at the subscription price of EUR 1,10 per share, which equals to the volume weighted average price of Cleantech Invest Plc’s class A share on First North Finland during the time period between 13 April 2016 and 13 July 2016 and at a discount of 5%. The Offer Shares were subscribed for in full by a small group of investors. The entire subscription price of the Offer Shares will be recorded in the reserve for invested unrestricted equity. The Offer Shares represent approximately 3.65% of the outstanding shares in the Company after the Offering, when taking into account also 150,000 new class K shares subscribed based on the Company’s stock options 2013 as well as 41,268 new class A shares subscribed in the share exchange executed in connection with the Company’s investment in ResQ Club Oy, the registration of which to the Trade Register is pending on the date of this resolution. Cleantech Invest portfolio company Enersize, of which Cleantech Invest owns 44%, has during the last year implemented its cloud-based energy saving software for compressed air systems at several large-scale industrial sites in China. The business model of Enersize is to share the profit from achieved energy savings with the customers during a 3-4 year contract period. Enersize’s first major customer to enter into the revenue-sharing phase is one of the world’s largest flat screen manufacturers, Bejing Opto Electronics (BOE). Enersize has now received the first 300,000 EUR payment based on accomplished energy savings. The total expected income for Enersize during the BOE contract period alone is estimated to exceed 1.2 MEUR. SavoSolar announced in June 2016 that it is considering issuing new shares through a rights offering whereby the shareholders have the right to subscribe for the new shares in proportion to their current shareholdings in the company. According to the plan of SavoSolar’s Board of Directors the aggregate number of new shares to be issued is 11,930,156 shares, corresponding to approximately 42.86 % of all the shares in the company after the rights issue, if the rights issue is fully subscribed. The subscription price per share is planned to be EUR 0.33 per share. On 12 July 2016, the Extraordinary General Meeting of SavoSolar authorized the Board of Directors to resolve on the rights issue. In June 2016 Cleantech Invest launched a series of ‘Pop-Up’ Offices in new markets in order to raise investor awareness of the Cleantech Invest share. The goal is also to boost selected portfolio companies’ growth on international markets. The timeframe for the ‘Pop-Up’s are a couple of months. The first Pop-Up was launched in Los Angeles in June, August in Stockholm, and a third will follow in Berlin in September. Cleantech Invest Oyj Q3/2016 quarterly summary, which is not a financial performance report or a fully comprehensive report of all events, will be published 31.10.2016. The 2016 financial statement will be published on 31.3.2017. In other respects, the 2017 financial information release schedule will be published by the end of 2016.